Great time to update your closet and/or pick up a few new shorts and tees for your summer vacation. Don’t forget to check out all of the Lowest Price Of The Season Sale for Women’s And Kid’s, too! Tax Day is always met with dread and fear, maybe this will help. On Monday, April 15th you can score a lot of great freebies and deals including food and drinks. A great way to pat yourself on the back for getting your taxes completed on time. Great Job! Here’s a list of our favorite deals! Thanks to USAToday and for compiling this list! Amazon Restaurants –: Eat at your favorite restaurant while de-stressing at home. Code EAT7 gets you $7 off your first order with Amazon Restaurants. B.Good– Get a free green or grain bowl OR a free burger on Tax Day if you download the B.Good app. If you already have the B.Good rewards app, you’ll receive free fries with any purchase on Tax Day. Bananas Smoothies & Frozen Yogurt– Get a free small frozen yogurt Monday, April 15. Bite Squad and Waitr– The online and mobile food delivery services are offering “no delivery fees” when customers spend $20 or more on food with promo code TAXDAY19 for orders placed on the services’ apps or www.bitesquad.com or www.waitrapp.com. BJ’s Restaurant & Brewhouse– Monday’s special is half off any large deep dish or tavern cut pizza, plus $5 Brewhouse Margaritas. Boston Market–The $10.40 Tax Day meal special includes a half chicken individual meal with two sides, cornbread, and a regular fountain beverage drink, while supplies last. No coupon is needed and the offer is available from April 10-15 at restaurants and for online delivery. Bruegger’s Bagels– With the annual tax time deal, get 13 bagels and two tubs of cream cheeses, for $10.40, a $3.50-plus deduction, from April 10-15 at participating bakeries. To get this offer, be a member of the Bruegger’s Inner Circle or claim the offer at www.brueggers.com. BurgerFi– The chain is celebrating Tax Day with $4.15 BurgerFi Cheeseburgers on Monday, April 15 through the BurgerFi app only. Download the app at www.burgerfi.com/rewards. Chili’s – All month long, get the Straw-Eddy Rita (lemons, strawberries, vodka, tequila) for $5. Corner Bakery Cafe– Get two entrees for $10.40 April 15-17, in-café only. Farmer Boys– Get two Breakfast Burritos or two Double Big Cheeses for $10.40 Monday at participating locations. There is no limit to the promotion and no coupon is required. 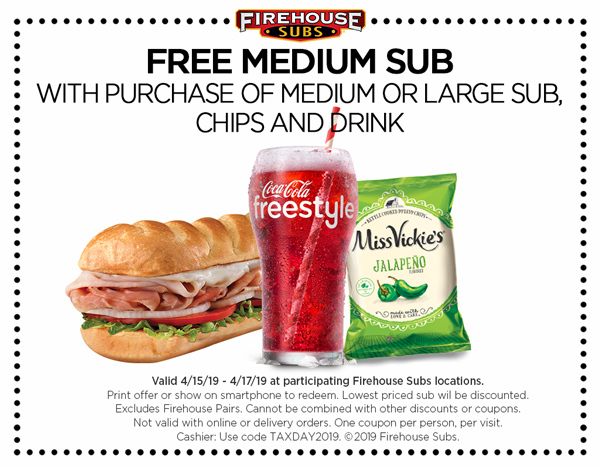 Firehouse Subs– Get a free medium sub with purchase of a full-price medium or large sub, chips and a drink April 15-17 at participating locations with a coupon that can be printed out or shown on a phone. Great American Cookies–The national gourmet cookie shop continues its annual Tax Day tradition. Get one free Original Chocolate Chip Cookies at participating locations for stopping by. Hardee’s– The fast-food chain is giving away free sausage biscuits from 7 to 10 a.m. Tax Day at participating locations. To get this freebie, you need to say, “Made from scratch.” One per customer, while supplies last. Tax not included. Hot Dog on a Stick– Get one free Turkey or Veggie Dog participating locations for Tax Day on Monday, April 15. Limit one per customer. No purchase or proof of completed taxes necessary. Kona Ice– Tax Day is Kona Ice’s National “Chill Out Day.” Stop by the company’s island-inspired trucks during select hours Monday for a free cup of tropical shaved ice. Find participating hours and locations at www.kona-ice.com/chill-out-day. Menchie’s – Download the app by April 15, and get a free $5 frozen yogurt. The Menchie’s Money coupon will show up automatically in the app. Mountain Mike’s Pizza– Get $3 off any large using code 481658 or $8 off any two large pizzas using code 883457. Noodles & Company– Members of NoodlesREWARDS will get $4 off online and mobile orders of $10 or more for Tax Day. The offer is valid from April 10-15, but to get the offer you need to be signed up for the program by April 9. Sign up at www.noodles.com/rewards. Office Depot/OfficeMax– Through April 27, get up to five pounds of documents shredded for free with a coupon posted at www.officedepot.com. Planet Fitness– This relaxing Tax Day promotion runs from April 11-20. Members and non-members can use available HydroMassage chairs with a coupon that will be available at www.planetfitness.com starting April 11. Potbelly Sandwich Shop– Get a buy-one-get-one-free entrée at locations nationwide for Tax Day when you mention that it is Tax Day. Schlotzsky’s– Get a free small original sandwich with purchase of chips and a medium drink Tax Day. This deal is available at all locations and no coupon is needed. Smoothie King– Get $2 off any 20-ounce smoothie April 15-18 with Smoothie King’s Healthy Rewards app. More information will be posted soon at www.smoothieking.com/taxday. Sign up for the app at www.smoothieking.com/healthy-rewards. Sonny’s BBQ– The barbecue chain has an IRS – Irresistible Ribs Special – Monday with half-priced Sweet & Smokey or House Dry-Rubbed Rib dinners, which include two sides and bread. White Castle– For Tax Day, the fast-food chain will offer 15 percent off any order in-Castle with a coupon that will be posted on social media pages and sent to email subscribers. Elizabeth Arden – Use Promo Code SPRING to get a free seven-piece gift with orders over $50 through April 15. JCPenney’s Salon – Free Deep Conditioning with any haircut & style with printable coupon. Kohl’s – Use Promo Code Catch15 OFF to get 15% off purchases over $100. Valid of April. Naturalizer – Use Promo Code NAT2PAIR by April 15, and get 20% off when you buy two pairs of shoes. Sephora – Until April 17, snag this freebie: Free Urban Decay Eyeshadow Primer Potion trial size with orders over $25 with Promo Code POTION. Expedia – Hotel and Flight Packages under $499 per person*. Hotels.com ~ Book early for Summer and save up to 40% Off*. Travelzoo – Top 20 Travel Deals Of The Week including Things To Do in your local area. Still need to file? Stop Procrastinating! These deals will help you get your taxes done right. Groupon – Get 20% off tax software. Discount rate may vary. TaxSlayer Use Promo Code OFFER20 and get 20% off when filing your federal return. Sam’s Club – Put your membership card to good use and score a great deal on TurboTax Software. Amazon – Check daily deals on Amazon.com for savings on Tax Software. They no we are slackers when it comes to filing taxes and often offer last minute deals. All deals listed are a limited time offer. Gorgeous set and on Rollback! Great buy for the Littles! Yeah it will hurt if you step on them, but they’ll love adding these to their collection! Tiny Pocket Place: Opens to reveal a specific location, two additional secret reveals, three accessories and a micro-figure.